The 11 series is double adjustable. The 12 series is triple adjustable. The 14 series is quadruple adjustable. The 12.5x is featured with our 50-DA shaft, this allows you to fully operate only on the shaft/ only on the reservoir or a combination. With this feature you can adjust the amount of hysteresis. 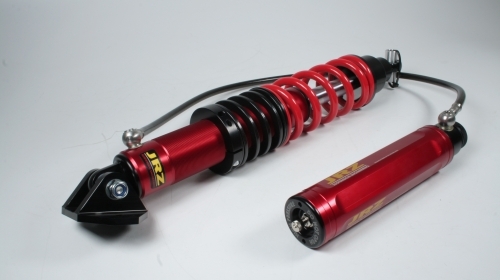 The 12.3x is featured with our regular motorsport shaft with rebound adjustment on the shaft and compression (high and low) adjustment on the reservoir. We recommend at least every 2 racing seasons or sooner if you track a lot. Dampers are like engines, you don’t need to change the oil frequently, but the parts last longer and work better throughout their lifetime if you do. 100-350 psi (factory setting is 220 psi). 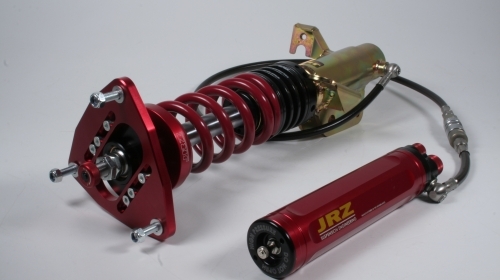 Contact the dealer where you purchased the set or contact JRZ for advice. Internal valving can be changed and is customized upon order or at a service center. 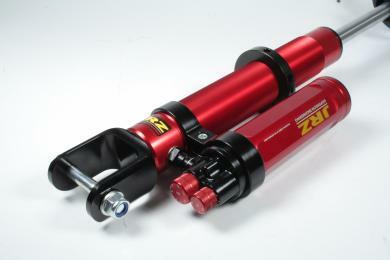 JRZ Suspension Engineering is proud to offer the 12 series; triple adjustable motorsport damper. 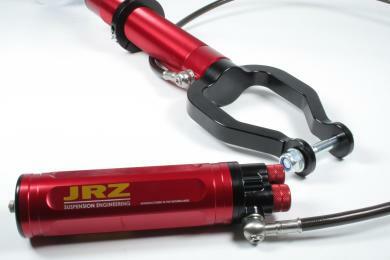 The JRZ 12 series is an expansion of our damping philosophy, which is to control the unsprung mass. 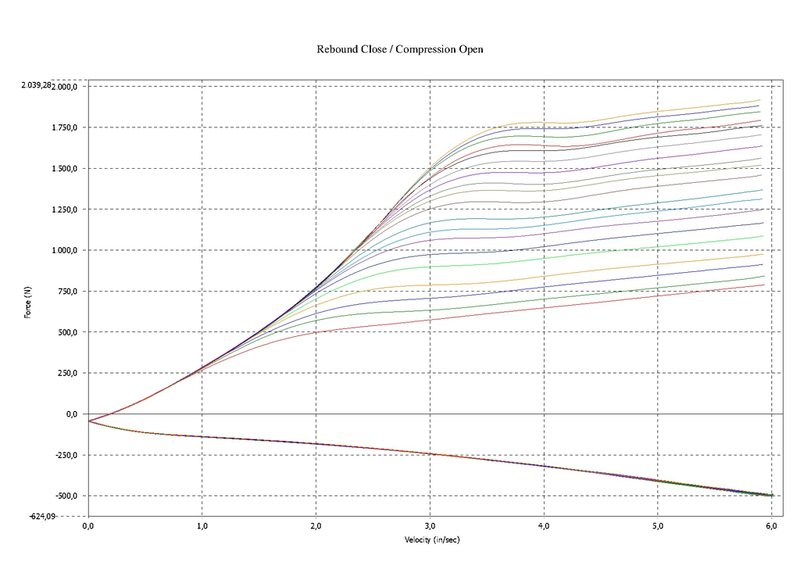 Added from the 11 series is the low speed compression adjustment, allowing pitch, roll, and balance to be tuned. Compression and rebound independently adjustable. Rebound adjusted by orifices on the piston rod with check valve so there is no cross talk between the rebound adjustments and compression forces. Compression adjusted by blow off valve in the canister. 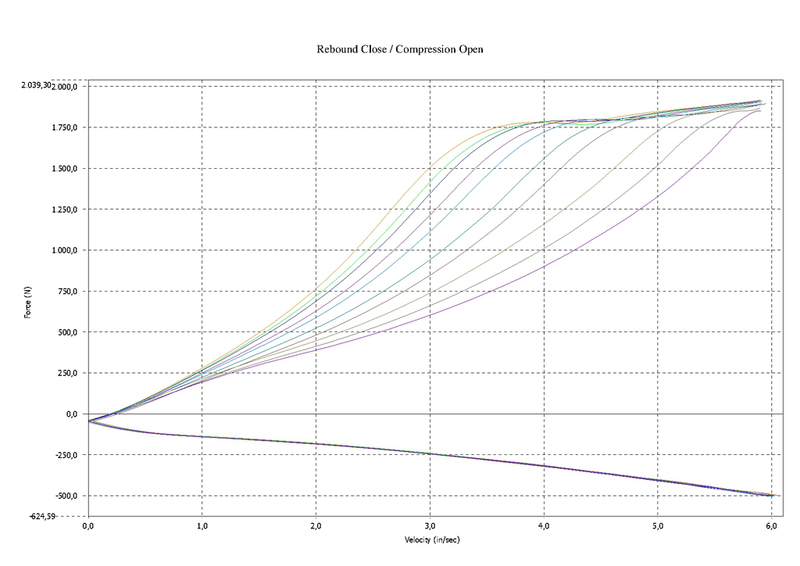 Above is the high speed compression adjustment range of a typical JRZ 12 series. The blow off system, innovated by JRZ, is seen moving the opening point of the valve up and down. The full range is useable and each step is a fine yet noticeable increment. 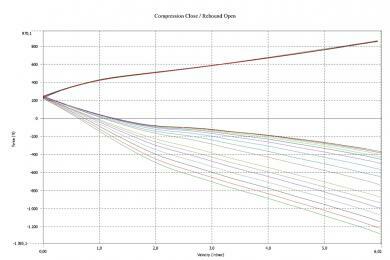 Above is the low speed compression adjustment range of a tpical JRZ 12 series. The low speed adjustment, innovated by JRZ, is seen by the changing angle of the force line. The low speed adjustment is usable at every high speed click. 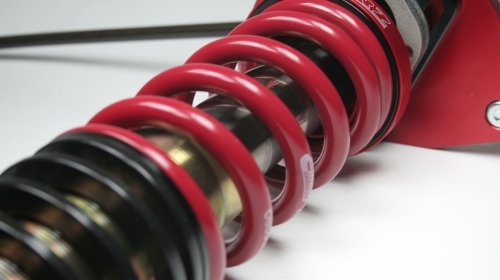 Sprung mass is controlled with rebound damping, delivered smoothly by the 8060 motorsport piston. 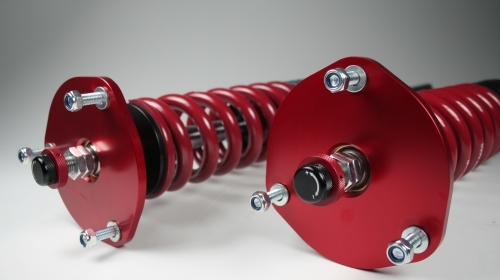 The 12 series rebound system and 8060 piston provides a linear damping characteristic with smooth pressure development independent of compression forces. This allows the damper to transition between rebound and compression efficiently, maximizing grip and reducing tire wear. 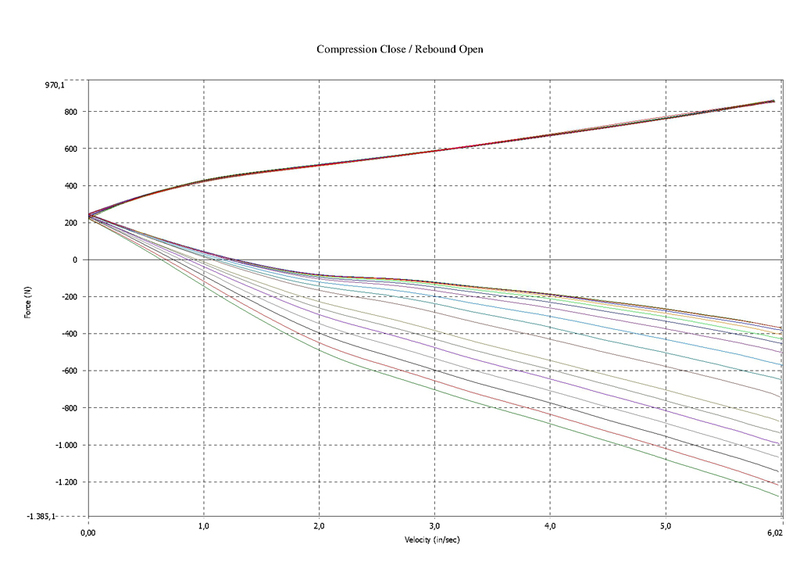 Above is a graph of the rebound adjustment range of a typical JRZ 12 series. It can be seen that the steps are even, the range is large and the curve is smooth. 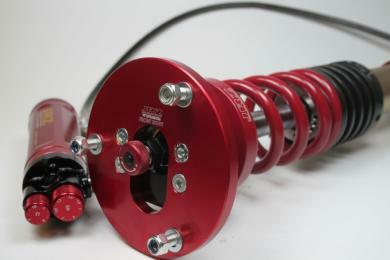 This allows the chassis to be tuned predictably, step by step. 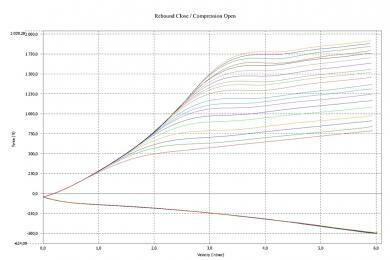 Using compression damping to control the unsprung mass will result in less tyre wear and better tyre temps. The unsprung mass will move according the tyre’s natural frequency. Using the compression damping the contact patch of the tyre to the road will be maximized. 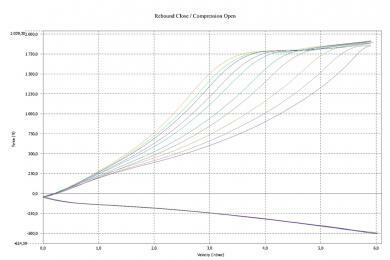 Damping is available over a large adjustment range with fine tuning increments. Set up is easy to find and spring rates can be changed without having to revalve the damper. 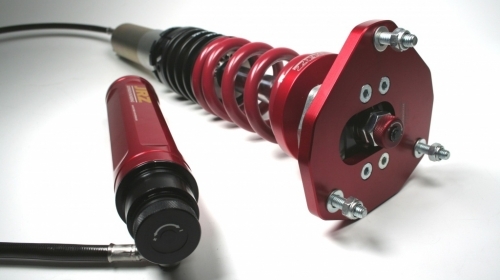 The combination of the 22 mm shaft and the use of nitrogen pressure results in a lifting force created by the damper. This lifting force is available through the whole stroke of the damper and works together with the spring, The lifting force is not a springrate, but gives the car platform.